Approximately 70% of Australians exceed the NHMRC recommended daily intake for sodium1. Typically, hypertension is recognised as a major outcome of a high sodium (HS) diet, however, there is mounting evidence that HS diets also lead to insulin resistance, even in the absence of hypertension. We have shown that insulin possesses vascular actions that enhance microvascular blood flow in skeletal muscle, resulting in increased glucose uptake. The aim of the current study was to determine whether HS-induced insulin resistance develops due to a loss of microvascular insulin sensitivity. 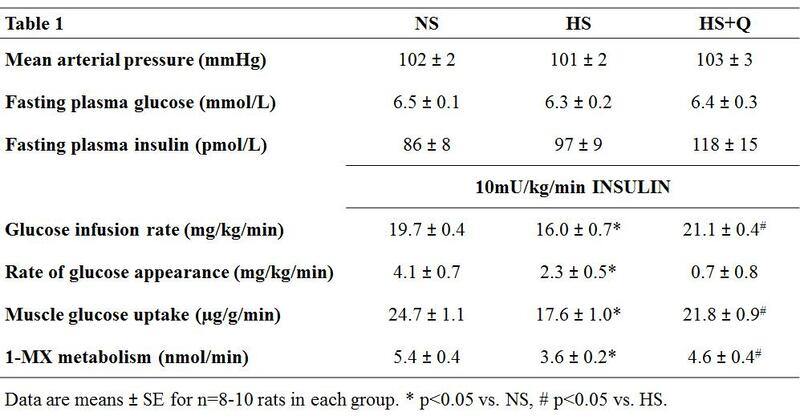 Sprague-Dawley rats were fed control (0.31% wt/wt NaCl, CTRL) or HS (8.0% wt/wt NaCl) diets for 4 weeks. Body weight, fat mass, blood pressure and fasting plasma biochemistries were unaffected by the HS diet. Euglycemic hyperinsulinemic clamp (10mU/min/kg) studies revealed that whole body and muscle glucose uptake were impaired in HS rats, even in the presence of enhanced hepatic insulin sensitivity. Skeletal muscle insulin resistance was present in vivo despite an enhancement of insulin signalling at the level of Akt, while insulin-mediated microvascular recruitment (1-MX metabolism) was completely absent in HS rats. Ex vivo studies revealed that insulin-mediated myocyte glucose uptake was normal in HS fed rats. Quinapril treatment (1mg/kg/day x 4 weeks) during HS intervention restored microvascular insulin sensitivity and muscle glucose uptake in vivo. HS-induced insulin resistance develops in response to impaired microvascular responses to insulin in muscle, and not due to metabolic or signalling defects in the myocyte. Quinapril prevented the development of microvascular insulin resistance suggesting a role for the renin-angiotensin system in HS-derived muscle insulin resistance even in the absence of hypertension. These data indicate that reductions in sodium intake may be clinically important not only for management of hypertension but also for insulin resistance and highlight muscle vasculature as an important therapeutic target for the prevention of insulin resistance. 1.Keogh et al., Public Health Nutr, 2012: p. 1-6.